ColoBiotica-28 contains 28 different probiotic microflora strains soil-based-organisms (SBOs) with fulvic acid and prebiotics - more than any product ever formulated to achieve the robust and healthy natural intestinal flora of pre-industrial nutrition. 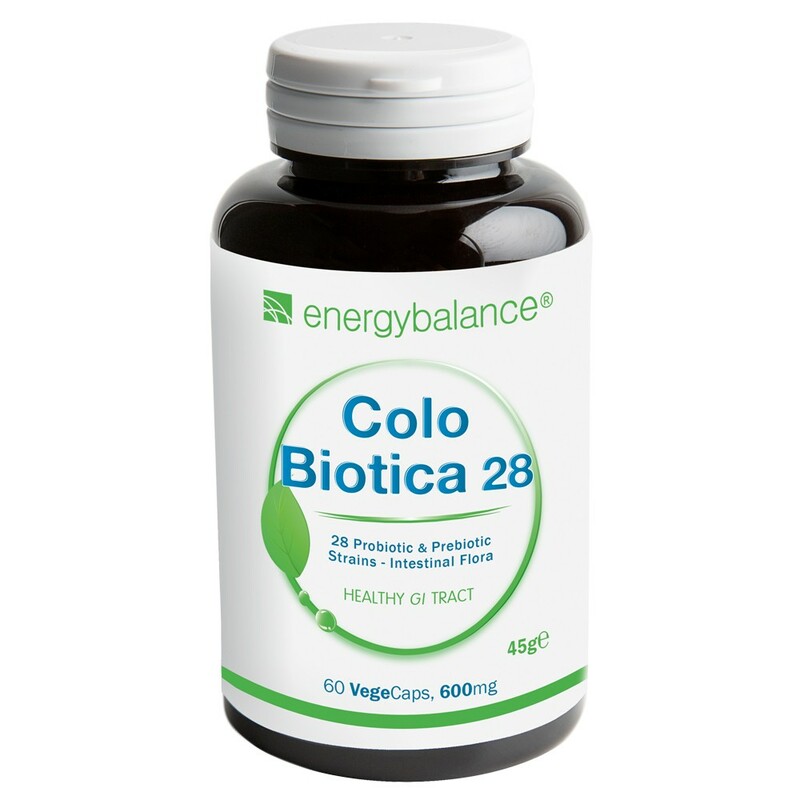 ColoBiotica 29 contributes to an improved and regular digestion and promotes the recovery of the natural intestinal flora. All 28 probiotic strains contained in ColoBiotica 28 are naturally resistant to acid, and can therefore pass through the stomach undamaged, in order to unfold their protective effect in the gut. Probiotic bacteria and other products are sensitive to the aggressive acidic environment in the stomach and need to be protected in special gastric juice-resistant capsules and should only be ingested this way. Contents: 60 VegeCaps à 600mg. The bowel (intestine) is the most important part of the digestive tract and, in adults, measures about 5 metres in length and due to its fine intestinal villi, has a surface of approximately 32m². Intestinal flora is the term for all of the micro organisms in the bowel. The majority of the immune system is situated in the intestine. Taking probiotic bacteria or probiotic foodstuffs (probiotica) supports the build-up and preservation of the intestinal flora. The intestine plays a main role in immune defence. A healthy intestinal flora, or a healthy bowel environment, consists of 5/6 of healthy and beneficial bacteria. This means a healthy bowel can cope with about 1/6 of bad and pathogenic bacteria. If the number of these pathogenic bacteria increases, the immune system becomes weakened. The intestinal mucosa contains lymphoid tissue with more than 70 percent of body-own immune cells. Aggregations of 10 to 50 lymph follicles, the so-called Peyer’s patches, sit in the small intestine. They are part of the “gut associated lymphoid tissue”, or GALT. Approximately 90 percent of all antibodies are generated here. Intestinal bacteria play an important role in immune defence. Problems occur when the intestinal immune system can no longer correctly differentiate between friend and foe. When the normal intestinal bacteria are no longer tolerated, chronic inflammatory diseases such as Morbus Crohn or Colitis ulcerosa may occur. When pathogens arrive in the intestine, the immune system needs to fight these with all its regulatory processes. Gram-negative bacteria, but also candida, i.e. fungi, is part of a normal, healthy intestinal flora. The intestinal bacteria have a number of important functions. In addition to immune modulation, they also act in the breakdown of specific nutrients. The human organism specifically uses the enormous arsenal of bacteria and enzymes for the break down of dietary fibre. Probiotic bacteria can trigger immune responses in the whole body via the intestine, including the activation of specific immune cells, the so-called T-cells. 1 - 2 capsules, swallow. Do not chew. Protect from sunlight. Store in a cool and dry place. Leonardite (Fulvosäuren), SBOs (Soil Based Organisms): Arthrobacter globiformis, Azospirillum brasilense, Azospirillum lipoferum, Azotobacter chroococcum, Azotobacter paspali, Azotobacter vinelandii, Bacillus amyloliquefaciens, Bacillus atrophaeus, Bacillus licheniformis, Bacillus megaterium, Bacillus pumilus, Bacillus subtilis, Bacillus thuringiensis, Bacillus firmus, Brevibacillus brevi, Cellulomonas fimi, Kurthia zopfii, Micrococcus luteus, Nocardioides simplex, Pseudomona fluerescens, Pseudomona putida, Rhodobacter sphaeroides, Rhodococcus rgodochrous, Rhodopseudomonas palustris, Rhodospirillum rubrum, Streptomyces griseus, Streptomyces griseoflavus, Streptomyces venezuelae, L-Leucin, Bambus Extrakt (Bambusa vulgaris), Cellulose (VegeCaps).